Wendell Ford’s greatest accomplishment: The former Kentucky senator who defied Mitch McConnell is responsible for the motor voter law. Former Kentucky Sen. Wendell Ford passed away on Thursday. His greatest accomplishment came from defeating Sen. Mitch McConnell. 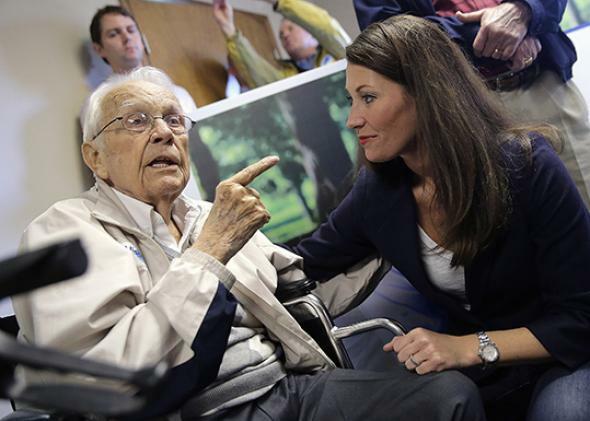 Former Kentucky Sen. Wendell Ford (left) speaks with Democratic Senate candidate Alison Lundergan Grimes on Nov. 3, 2014, in Owensboro, Kentucky. Left unmentioned was McConnell’s long-running clash with his fellow Kentucky senator. In fact, McConnell had tried—and failed—to block what became one of Ford’s greatest accomplishments as a senator, the motor voter law of 1993, making it easier for Americans to register to vote. The battle is worth briefly revisiting on the occasion of Ford’s passing because it not only speaks to Ford’s legacy but also sheds light on the Senate’s new majority leader and foreshadows our current era’s bitter fight over voting laws. A native of Owensboro who initially went to work alongside his father in the insurance business, Ford was a textbook Kentucky Democrat, better known for his staunch defense of the state’s interests—in tobacco, coal, and whiskey—than he was for writing big legislation. But in the early 1990s, he joined with Sen. Mark Hatfield, a moderate Republican from Oregon, to tackle one of America’s great civic weaknesses, low voter participation. They drafted the legislation that became known as the motor voter bill, which made it more convenient to vote by instituting automatic sign-up at motor-vehicle registration, as well as allowing voter registration by mail and at a wide array of state and local government offices. It would seem like a difficult measure to oppose. But McConnell, then heading into his second term in the Senate, made it his mission to try to block his fellow Kentuckian’s initiative. He argued that the bill was an unfunded mandate that gave the states new responsibilities without paying for them. In a preview of the voting wars to come a decade later, he warned that the bill would open the door to voter fraud. And he admitted, with the impressive candor that he occasionally flashes, that his opposition was not exactly free of personal and partisan motivations. McConnell and his fellow Republicans mustered enough opposition to the bill to block it via filibuster in September 1990. But Ford and his allies kept pushing it, year after year. As they inched closer to a filibuster-proof majority, McConnell’s arguments against it became harsher. At a March 1991 hearing, he declared, “This bill wants to turn every agency, bureau, and office of state government into a vast voter registration machine. Motor voter registration, hunting permit voter registration, marriage license voter registration, welfare voter registration—even drug rehab voter registration.” In March 1993, he attacked Ford for refusing to drop the provision that allowed welfare and unemployment agencies to register voters. By letting social service agencies register voters, he said, the bill “discriminates against taxpayers in favor of welfare recipients.” It was not hard to miss the signals that McConnell was sending about the bill and who would benefit from it. McConnell tried to weaken or sabotage the bill with clever amendments, including one that would make voter fraud or corrupt acts by officials at any level—federal, state, or local—a federal crime with a maximum penalty of 10 years in prison, and one that would have nullified the registration law in any state where it did not increase voter turnout by at least 2 percent. His efforts finally came to naught. The bill passed in May of 1993 and was signed into law by President Clinton. But that didn’t stop McConnell. A year later he introduced an amendment to the reauthorization of the supplemental nutrition program for poor pregnant women and mothers of young children (WIC), seeking to bar the program’s offices from offering voter registration. Doing so, he said, was distracting from the program’s primary purpose. The amendment failed, and motor voter has since become enshrined as an accepted part of the landscape, a tribute to Ford’s persistence. But McConnell’s crusade against an overabundance of voting carried on. After the Florida election debacle of 2000, McConnell led the Republican side in crafting the bipartisan election reform law of 2002, and his emphasis in those negotiations was guarding against “voter fraud,” which would become his party’s watchword for the decade to come.